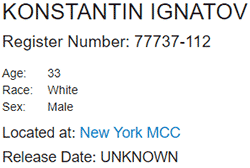 Konstantin transferred to New York, who is "sealed defendant 1"? The other reason OneCoin’s whine is pathetic even by Ponzi standards is that it ignores the fact OneCoin is getting the chance to prove its innocence. Ignatov’s eventual trial, the German investigation, etc. It would get it even faster if its executives didn’t flee to Thailand and all over. Looking who defends him as a lawyer says it all. Now it is all about damage control, because for sure Greenwood is the snitch. Each and every attempt to “slender” Ruja has failed. Yeah, she remains fat no matter what. In the article, in the English translation it says Konstantin has been sentenced to 20 years in prison. This is false. He hasn’t had his trial yet. If he is found guilty of this one charge the max sentence is 20 years. The OC’ers are going to jump all over this and claim it is more fake news, more lies, and us haters can’t tell the truth. I find it funny that they quote Wikipedia as a source of good information. Great lawyer. Helped el-chapo big time. Got him a steel and concrete box with 1 hour of daylight per day for the rest of his life. Fun fact: Konstantin and El Chapo are also being held in the same facility. In the English translator I used it translated that he was convicted and given a 20-year sentence. What it really said is that if he is convicted he faces a 20-year sentence. This is the second time the translation from Bulgarian to English was wrong. Not sure why, but frustrating it happens. I have tried Google and Bing and both translated it differently from the other. Weird. It is a great article and highly recommend you read it. It is especially great for those who know nothing about OneCoin, Ruja and Konstantin. Also exposes all the fake news from the OneCoin “official company line” this is all a witch hunt.